Making butters varied across the country, according to the traditions of a particular area. Cheap butter was made from sour cream and it was only top quality butter that was produced from milk. 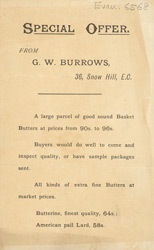 Irish butter was considered fair quality and it was Cambridge and Epping butter that was considered the best sold in London.